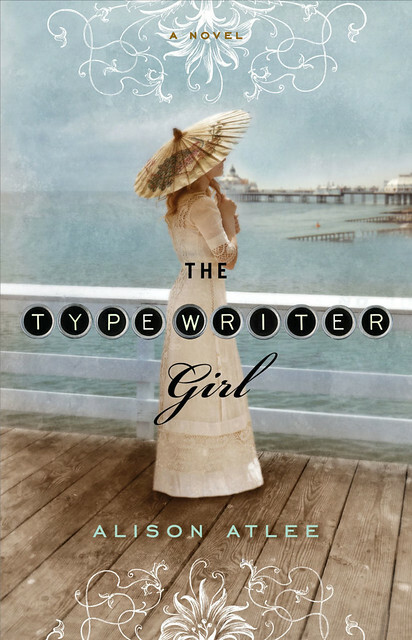 I am delighted to present an interview with Alison Atlee, whose debut novel, The Typewriter Girl has been released to rave reviews (including my own!). Alison Atlee spent her childhood re-enacting Little Women and trying to fashion nineteenth century wardrobes for her Barbie dolls. Happily, these activities turned out to be good preparation for writing historical novels. She now lives in Kentucky. Alison has also produced a special treat for Edwardian Promenade readers, so read on to the end to find out! When Betsey disembarks from the London train in the seaside resort of Idensea, all she owns is a small valise and a canary in a cage. After attempting to forge a letter of reference she knew would be denied her, Betsey has been fired from the typing pool of her previous employer. Her vigorous protest left one man wounded, another jilted, and her character permanently besmirched. Now, without money or a reference for her promised job, the future looks even bleaker than the debacle behind her. But her life is about to change . . . because a young Welshman on the railroad quay, waiting for another woman, is the one man willing to believe in her. Mr. Jones is inept in matters of love, but a genius at things mechanical. In Idensea, he has constructed a glittering pier that astounds the wealthy tourists. And in Betsey, he recognizes the ideal tour manager for the Idensea Pier & Pleasure Building Company. After a lifetime of guarding her secrets and breaking the rules, Betsey becomes a force to be reckoned with. Now she faces a challenge of another sort: not only to outrun her sins, but also to surrender to the reckless tides of love. . . .
Do you have a background in Victorian history (grew up reading Dickens, Eliot, et al, education, etc), or was the period completely new to you when you were inspired to write The Typewriter Girl? I wasn’t starting from zero, even though I’m not a historian. A lifelong interest in the 19th century has always steered me to studies and reading and travel that fed it. Betsey is one of the more unique heroines I’ve read in historical fiction—did she come to you fully formed, or did you snag bits and pieces of her personality as you wrote? It took me a while to get to know her. But in an early draft of the story, Betsey was in Idensea (the seaside town which is the main setting) first, and then returned home to London. When she walked into her flat, there was a man in her bed. I said, “Hey, you’re single, so who’s this?” From that point, I knew she was not the traditional Victorian miss, and she just kept surprising me (see below for more on that). Listen, I was once highly skeptical when authors talked like this, as though their characters acted outside the writer’s imagination or will. But then it happened to me. 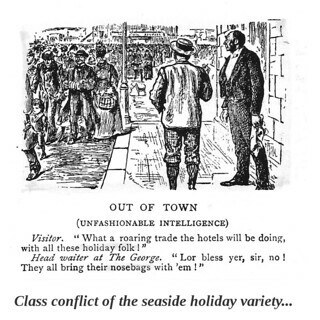 Issues of social status amongst the lower middle classes in late Victorian England are an important aspect of The Typewriter Girl. Did you find dealing with this layer of society more interesting than the more typical aristocratic protagonists we usually see? The research led me on this. There were so many class issues surrounding these seaside towns as they grew into tourist destinations. Cheap rail fares meant you had rich and poor spending their leisure time in the same places, and it was an uncomfortable shift, at least for some. Like the conflicts surrounding the town of Idensea in The Typewriter Girl, controversies arose as developers had to decide what class of patron they wanted to attract. There were even types of amusements considered appropriate for the upper class, and others for the lower class. In the book, a pleasure railway (sort of an early version of a roller coaster) is an issue because it’s considered vulgar by some. There was also something of a practical side to this. A book like The American Heiress (Daisy Goodwin), with such an extravagant, exclusive world, is fun and fascinating for me. And my original idea for Betsey’s love interest was an aristocrat. But when I came to write him, I felt, What does this guy do all day? The options that sprang to mind just weren’t that interesting to me. I knew two working class characters as the leads would make my story different from most of what I’d been reading. I liked that, even though I knew it was a risk that could discourage an agent or a sale. Luckily, the story found people willing to take the chance. I could taste, smell, and see the seaside resort where Betsey is so anxious to work—have you visited any existing English seaside resorts, or did you construct this setting from research? Both. One time I landed in London with a couple of weeks before I had to be anywhere in particular, and decided in baggage claim that I would head for Lyme Regis (because of Jane Austen, of course). I ended up traveling along the coast and falling in love with it. Research fleshed out the rest of the setting; Idensea is a mix of some of my favorite seaside places. There is a fairly strong romance thread in The Typewriter Girl, which surprised and pleased me. It is, however, very unflinching and difficult. Did you have a clear view of its outcome, or was that up in the air until you completed the book? The power dynamic between John and Betsey made things complicated–he has some authority over her in the pier company where they work, while her sexual knowledge gives her certain advantages over him. But in Victorian society, that knowledge puts her at a disadvantage, too, and causes John to see her in a limited way at first. Plus, they have conflicting ambitions. So yes, some tough elements. Despite what people kept trying to tell me, I thought I was writing romance, so I knew from the start there’d be a happy ending for John and Betsey. Just not how. Who were your most challenging characters to write? Betsey was hard, because she kept saying and doing things that made me say, “Are you sure about that? ?” I constantly questioned her in a way I didn’t the other characters. And I hated Sir Alton (the landowner and president of the pier company) through several drafts. I didn’t know what to do with him and was annoyed that he kept becoming more important in the plot. I finally figured out that while Betsey needed to see what could happen when she went after a dream (something John shows her), she also needed to see the consequences of suppressing a dream. And then I knew what to do with Sir Alton. Was The Typewriter Girl the original title? Some writers struggle with titles, but I usually have a moment when I just know a book’s name. When “Good Betsey” surfaced, I knew it was a bad, bad title and would never make it to a cover, but that was the book’s name. I was attached to it, but not at all surprised or upset when my agent suggested a change. “The Typewriter Girl” is something people can connect to more tangibly. Any interesting research tidbits you were forced to delete from the book? There’s a scene in the book where the pleasure railway breaks down. In the original, my entire development of this consisted of something like, “and then it stopped and refused to move again.” During revisions with my agent, she very rightly made the note, “might want to flesh this out a little.” Researching the mechanical minutiae of roller coasters sounded like the most horrible chore. “If it sells, I’ll fix it,” I promised myself, and hoped my agent wouldn’t notice that I had skipped that part. The book did sell, thank goodness. Eventually I had to face that scene again, and like most things we dread, fixing it turned out to be not bad at all. I found a period account of a breakdown where passengers on the ride had to help push the car to the top of the coaster. Coming from an age of litigation and safety regulations, I was floored to read this and had to put it in The Typewriter Girl. And yes, that’s the opposite of what you actually asked. But that’s the tidbit that sprang to mind. Convince skeptical readers why they should try your books in less than ten words! Whatever you’re expecting, you have satisfying surprises ahead. Can you share what’s next on the horizon? I’m working on a story that explores the origins of a fairy tale. 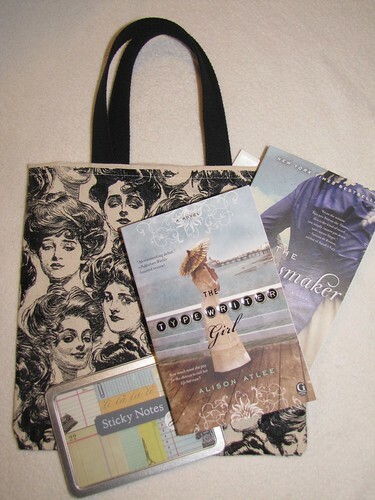 Alison’s special treat is a giveaway of a vintage office-themed sticky notes, a copy of Kate Alcott’s The Dressmaker, and The Typewriter Girl, all in a canvas bag with a Gibson Girl print! Leave a comment below to be entered into the drawing!! Connect with Alison on Twitter, Facebook, and her personal Website, and visit her amazing Pinterest board for the book! What a great giveaway – this book is on my ‘must read’ list! Wonderful interview about a fantastic era! I would love to win this! I’ve always thought of myself as “Gypson” girl because of my last name 🙂 Thanks for the great giveaway! Thank you for telling the back story about the particulars of your research. It sounds like a great story and I look forward to reading it! This sounds like a wonderful story! Thanks for sharing about your research. It was fun to read how your characters lead you along the path of discovery. I love the time period and setting. This book sounds wonderful! What a great giveaway! Sounds like an interesting book. Beautiful bag too! This is on my reading list, already – I love the theme, and it’s clear that it’s been lovingly written and carefully researched. The Edwardian Era was a time that had escaped my notice for most of my life, but I’ve been very interested in that period for the past 4-5 years, and have read quite a bit, now – so thanks for the post, and I’d love to win the drawing. But if I don’t, I’m going to read the book anyway! Oooh, this book has been on my to-read list since before Christmas. Can’t wait to pick it up! Amazing! Thanks for the interview! I will read the book no matter… the subject sounds fantastic. I think in canada we tend to forvet how snobbish the english were! What a fun giveaway! This book is on my TBR list and it would be great to win it. Love the Gibson Girl bag too. What a new twist. Excited to dive into this new read. I adore that cover. Very pretty. Have added to Amazon wish list! Really want to read it!! The book title reminds me of my grandmother’s story of her cousin who went to Martha Berry College in Georgia in 1914 and graduated. She then moved on to Atlanta where the only job there for her, was as a TYPEWRITER GIRL at the largest newspapers in the Southeast! Story turned out well for her as she met one of “THE” scion’s of Atlanta Society, a son the Newspaper editor and they married. Sounds like a wonderful book & will be added to my wish list. What a beautiful lot, I would love to read that book!! What an interesting plot! I’d love to read this! This sounds fascinating! I can’t wait to read this… good luck everyone! These are both on my to read list. I have read such great reviews of the Typewriter Girl that I am looking forward to getting it. I would love to win this. I am trying to read more this year and what a great tote to carry my books in. Thank you for the giveaway opportunity. This book is on my goodreads list to read! I would love to win the goodies! Loved this interview! And I would love to win this giveaway, thank you for the opportunity! Oh, what fun! Delightful giveaway. I’ve been hearing a lot of good buzz about this book. It sounds excellent. What a fantastic interview and great insight to the book. The giveaway is delightful. I can’t wait to read this with book in hand. I am “guilty” of having a kindle for a few months now and I see it’s merit for travel and reading on my lunch hour but it does not replace the feel of a good book and the lovely art work that is on the cover. I can’t wait to read “Typewriter Girl”! I enjoy a good read and truly like a real book as opposed to my I-pad. Thank you Alison for this interesting story and this great offer! Hi Alison-The description of your creative process is charming. How long did it take you to write the story to your satisfication and before the agent and editors got involved? Thank you!! It looks like a good book to read. This sounds like an interesting book – one I’d like to read! This sounds like a wonderful book. And a wonderful giveaway as well. I tweeted it. Looks like a very intriguing book! Interesting interview. I enjoyed the background info on the book. Looking forward to your next book! The books sounds like an absolute adventure–and what a lovely giveaway! Hi, I found this book to be intriguing and I would love to win! Thank you.